Teenage girls in Afghanistan are often caught in a conflict between fear of repressive traditions and brave hopes that their country’s postwar future will improve for women. 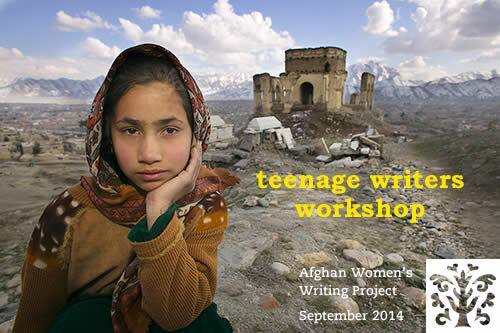 In this section—our third Teenage Writers Workshop feature in 2014—AWWP teens explore the conflict in pieces ranging from what career choices they have, to questioning society’s position on issues that have a profound impact on their freedoms. In What Will I Be, Anisa, 17, ponders her future career choices. Shahida, 14, in her essay When I Was Young, explains how she jumped from wanting to be a teacher and policewoman to wanting to be a lawyer and oncologist, and Frozan, 16, in I Want to Be an Astronaut, explains that astronauts know the value of life on Earth. Meanwhile Shahira, 13, in Surfer, Rock Climber, Gymnast, laments the lack of options for women athletes. Similarly in Orphan Girl, Alia, 15, says the solution to all this is to “discourage cultural habits that have a bad effect on society.” But it’s difficult, she says, when you look at her own school where a group came this year to give students and teachers information about rights and government and said girls should marry at 15. Finally, on the light side, don’t miss the lovely poems Rain and the series of poems about the provinces—Oh, Baba Sahib, Beauty of Sangkhalat, and Mazar My Homeland. To read the poems and essays click on the links below. Please help us by clicking the button and making a donation today. Beauty of Sanglakhat, by Zohra M.
Photo by Phil Borges; graphics by Blatman Design. I think that, these young women have an inspirational point of view, which i admire. I think that they inspire young women, in pursuing a career that benefits the welfare of others aswell as themselves.